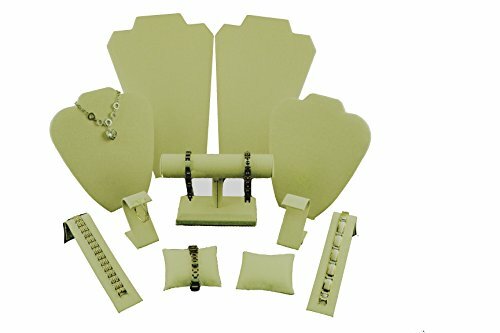 This beautiful, elegant set contains five pieces for displaying necklaces, one T-bar that can hold bracelets or watches, two pieces for holding earrings, two cushions for displaying watches or bracelets, and a piece for rings. Showcasing your jewelry is important, as it allows your customers to get a clear view of the beautiful accessories that you sell. However, more than a simple displaying of your jewelry, it is important to display them in a way that attracts the potential customers to your shop. For this, you need to have one of these Regal Pak 11 piece set displays, which is ready to offer a beautiful view of your accessories. 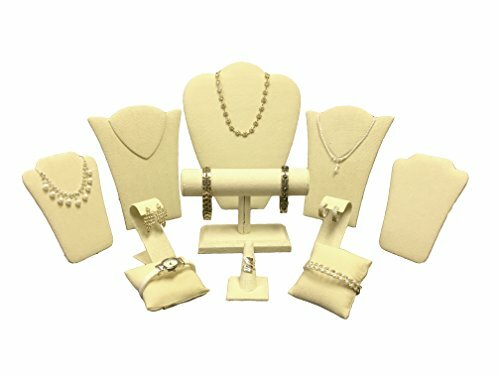 Including variously sized and shaped pieces for holding necklaces, earrings, rings and bracelets, this set is an excellent addition to your storefront window, display case, or shelf. Covered in bright linen, this set is an elegant choice, which allows each of the displayed jewelry to be completely visible. As the pieces are individual one from another, you can arrange them in any combination that you consider, to get a configuration that has a positive impact on your potential customers’ feelings. This helps you to get more potential customers to your store, as they are often attracted by the display they see. Given its simple design and exquisite cover, this set is an excellent choice for showcasing your precious jewelry. It enhances the sophisticated look of your store and of your accessories, and helps you attract the attention of anyone who wishes to buy some of your amazing items.